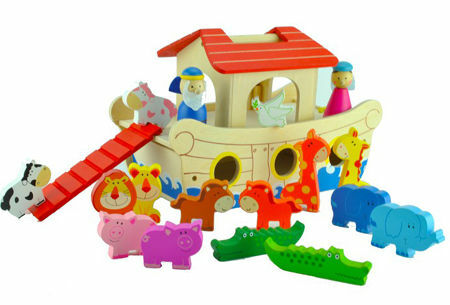 Noah's Ark Wooden Play Set is a simply made seventeen piece toy depicting Noah his wife and lots of animals two by two. Each animal pair is decorated or shaped differently to show male and female and there is also a little white dove. This Ark has a detachable ramp and the cabin top is removable so all the animals can be placed inside when its time to pack up. The whole deck of the ark also lifts off for easy access. This is a beautiful play set and when the flood comes you can save all the animals..... just be careful the crocodiles don't bite! Size: From bow to stern 30cm height 16cm. Noah is 5.5cm tall. Crocodiles are 7.5cm long. We like this because: "Such a beautiful play set with so many animals Fantastic! "